Rally Obedience is a new, fun dog sport that is easy to learn! Rally is a sport that tests both you and your dog's ability to navigate a course full of a variety of different instructions and challenges! 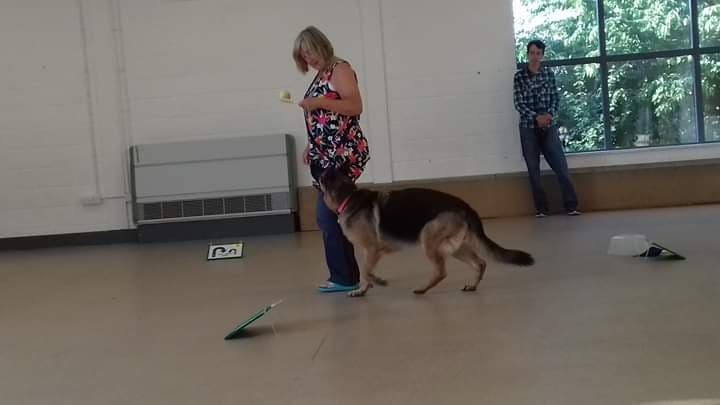 Rally is designed to be accessible to beginners, and demanding yet rewarding to more experienced handlers. Click here for more information regarding Rally Obedience! RALLY CLASSES WILL BE RETURNING IN 2019! This class aims to get you prepared for participating in your own rally competitions, from levels 1 to 6. Ask in club to find out when the next block starts!